Whip Antenna. Protrac iD provides active long range RFID solutions. The Protrac iD Whip Antenna can be used in 24/7 monitoring of tag signals such as heartbeat, duress alarm, tamper alarm, motion/vibration alarm and tag temperature over large areas. 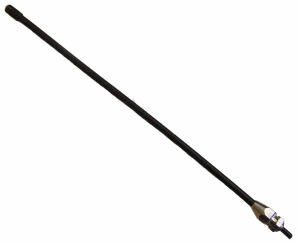 The 1RN120 is a general purpose whip antenna. When mounted vertically, it offers 360 degree uniform reception in the horizontal plane. Typically used for 24/7 monitoring of tag signals such as heartbeat, duress alarm, tamper alarm, motion/vibration alarm and tag temperature over large areas. The Whip Antenna is a unity gain ground independent vertically polarized antenna. The antenna is suitable for concealed mounting within partition dry wall construction and is suitable for outdoor wall or pole mounting, and attaching to vehicles. The antenna is supplied with 2.5 metre low loss 50 ohm coax cable with BNC female plug for connection to the Protrac range of RFID readers. Please get in contact for more details.